The stresses of modern life result in people being in a sub-optimal condition; suffering from fatigue, disturbed sleep, weight gain and generally run down amongst other problems. Frequently, individuals who manifest these problems can be dehydrated and depleted of vital vitamins and minerals, and restoring hydration and nutrients will often be very effective in reducing these problems and can sometimes, eliminate them all together! REVIV Wellness – A brand that provides a system of safe and effective intravenous hydration therapies and booster shots that are available in wellness spas throughout the UK and globally. Founded by four accident and emergency doctors with over 40 years’ experience in treating dehydration and restoring energy levels, IV hydration is a relatively new phenomenon in the UK. Celebrities and social elite have been early adopters of the amazing results of IV Hydration and Booster Shots but now, the time has come to bring modern wellness to the masses. These advanced treatments have proven to be effective and beneficial. Currently, there are three flagship clinics in London, Cheshire and Leeds with over 28 express clinics dotted around the UK. As well as worldwide flagship locations in Las Vegas, Miami and Johannesburg and express salons in New York, Ibiza, Ireland, Dominican Republic and Netherlands. The intravenous delivery of fluids and wellness agents via IV Hydration and Energy Booster Shots is the most efficient way to rehydrate and revitalise the body with key vitamins as they are administered straight into the bloodstream. The body is able to digest and absorb only 50% of vitamins and benefits via oral methods such as drinking water, energy drinks, vitamin supplements, tablets etc. With REVIV Wellness, the body is able to truly revitalised and refreshed with all key vitamins, essential nutrients and 100% of the benefits! As a result, the body is able to function at its peak and utilise these vitamins quickly and efficiently. The result is that energy levels are turbocharged and restores your body to its maximum level. For your body to healthily operate to the best of its ability, you need substantial vitamin intake and dehydration. REVIV Wellness delivers essential vitamins with their IV Treatments and Booster Shots, going directly where they are needed. Dehydration can wreak havoc on your body. Even just 2% dehydration can results in numerous detrimental effects; namely stress, loss of productivity, general discomfort and even damaged skin and organs. Several factors can influence an individual’s hydration levels, such as anything from sun exposure too illness, alcohol consumption, reduced fluid intake etc. Adequate hydration is of paramount importance to health and maintenance of the mind and body – REVIV Wellness leave you feeling and looking your very best. Experts in their field, REVIV are the highest quality, industry experts. Rest assured your treatments are being delivered by well trained and caring professionals – Board Certified Physicians and Doctors, Registered Nurses and Trained Paramedics. 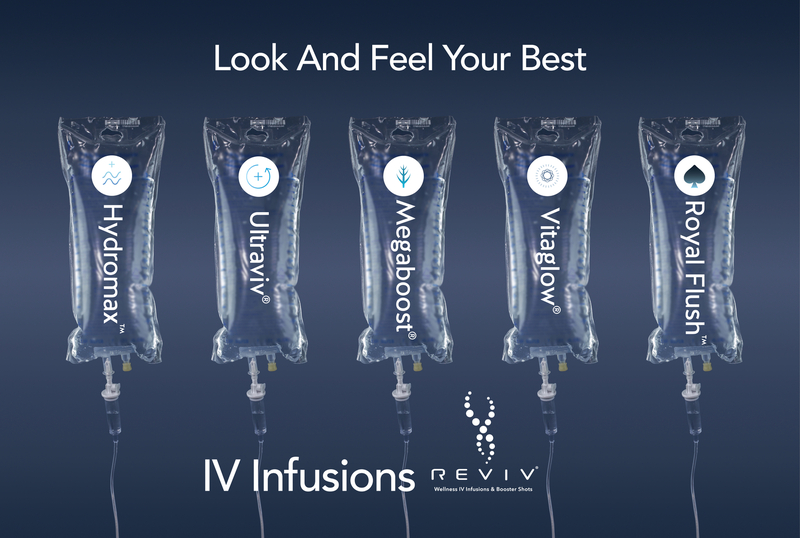 REVIV’s IV Hydration and Booster Shots are designed to replenish and restore hydration levels and bring your health back to its optimum performance. The administration of these treatments are multi-beneficial – alleviating tiredness, increasing alertness, boosting the immune system and even relieving depression – providing exceptional, visible and noticeable results. All whilst improving the visual appearance of skin, hair and nails, REVIV focuses on effectively improving the inside as well as outside of the body. Time conscious? You need not worry as REVIV provide fast delivery across all treatments. IV drips can take as little as 29 minutes and Booster Shots – only 10 seconds! For total body purification, REVIV’s Hydration Drips and Energy Shots are time efficient and pain free. So, if you need a quick “pick me up” during the stressful working week, you can even visit REVIV during your lunch break and even return to the office straight after with no downtime or aftercare. So recently I was feeling a little worn out, due to the fact that I had a full on “September to remember”, birthdays, events, visitors, parties, openings, back to work load, and continuous catch ups with friends after the summer….by the end, I was feeling the full effects, I had not really been in London much since May, so I was in the full force socialising mode….however my wellness was suffering from it. Years ago, I could work 60+ hours week, go out a 3-4 x times until the wee hours, and get a way with it, now however, I am usually very selective of my outings these days (* apart from last month clearly lol’) due to the effect it has on me, I savour my sleep and self care now, they are not just luxuries for me, they are necessities to help me feel and look my best….. so having had burnt the candles at both ends, as well as my husband hardly coping with this man flu / cough that didn’t seem to go away, I instantly thought, “Lets go recharge our selves”, with I.V vitamin therapy to give us a good boost. 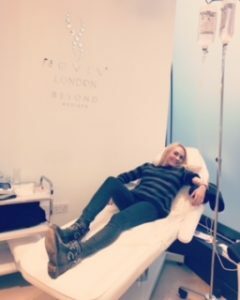 After some research and a recommendation from a friend, I got in touch with Reviv wellness– I had done something similar in a Ibiza after a very heavy weekend and still had ten days to go with a big group of friends, so I booked a drip and felt the effects instantly. I knew this must work magic if I’m just low on energy and a little run down, essentially I wanted to bounce back quick and try to boost my immune system to help combat any signs of this contagious cough and cold that half of London was suffering from. Tucked away in the corner of the impressive beauty lounge in Harvey Nichols, is a very white, clean and modern clinical type room. We were greeted by a very friendly male nurse, who was going to assist with our drips, whom was both very professional and pleasant at the same time, and made everything run smoothly and efficiently. After 45 minutes, we both felt brand new, like we had been injected with some life-force into us…literally. I had loads of energy, and my husbands cough went from heavy to mild within hours. By the time we got home, we felt fully refreshed and recharged for Saturday night, however we decided to have a cozy night in, cook some food and enjoy the wonderful infusion benefits. 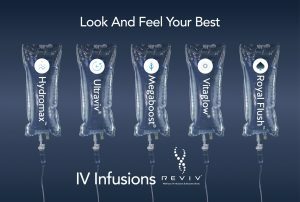 I would love to try the Royal flush one day, it is around double the price, however the deluxe IV infusion combines the recovery and purification benefits of both Ultraviv with the cleansing and anti-ageing properties of Megaboost infusion… hence why its called the royal flush :-). I definitely will be recommending to friends, family and clients around me, for those who need a good health and wellbeing boost instantly. Getting enough sleep, eating well, moving your body, combined with a monthly maintenance infusion, I can only imagine it would maximise the benefits of healthy living, and boost your sense of wellness naturally. Infusions at Reviv is a therapy I will try to add to my wellness regime regularly now to keep me in tip top form. REVIV is the only global brand and market leader in IV vitamin & hydration therapy. Launched in 2012 on Miami’s trendy South Beach, RE VI V have expanded rapidly and now boast 50 clinic locations covering 5 continents with further expansion into South America scheduled for late 2017. With Flagship clinics in metropolis cities including London, New York & Hong Kong, RE VI V have built a loyal following of global clients. Further information on RE VI V can be found on www. revivme. com.